When buying or building a home, most property owners see the garage as a necessary and key element. The daily function of the home often depends upon this extra space to house your vehicles, tools, workshop or a host of other possibilities. However, despite its steady use, it’s likely that your garage is long overdue for some proper cleanup and organization. Perhaps it needs a complete overhaul in order to fully utilize every square foot of storage and work space. If you wish to enjoy and take full advantage of your garage, then you need to ensure that it is well maintained and desirable to walk into each day. When we think of sprucing up the garage, we often gravitate toward hooks, shelves, and cabinetry. We think about all that can be done to better house all of our stuff, but we neglect to consider the ground beneath our feet and all that can be done to enhance the space by adding to the longevity of the floor itself. The basic, drab concrete floor of your garage can only last so long without the wear and tear eventually catching up to it. From spills and stains to cracks, your garage floor undergoes a lot of damage control and could likely use some help in preserving its quality. 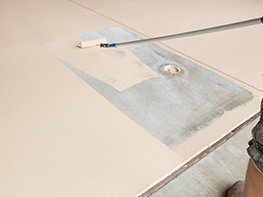 Abrasion resistance and chemical resistance are two very important considerations when a customer is debating on which type of garage floor coating to go with for their home. We understand this debate and recognize that each of our customers is working hard to best protect their valued investment. You want to add to the beauty and charm of your home by making even the garage look its best, yet you don’t want to sacrifice the necessity of having a place where your family can live life and make messes. Whether intentional or not, the garage just houses a lot of dirt and chemical spills, and there needs to be a serious level of durability and strength to whatever coating is applied to it. At Liberty USA Painting, we offer our customers only the best when it comes to products and service, and this includes your garage floor. As one of our superior painting services, this coating that we apply to your new or remodeled garage space will better protect its longevity while also bringing a pleasant aesthetic appeal. We take the time to well prep the surface area before we begin our application process, and our team of technicians work at a pace that is both careful yet efficient. We do not want to waste a moment of your time or a penny of your money, and that is why we work hard to deliver a solid product and professional customer interaction. Give us a call today at 469.919.1333 to learn more about what exactly a garage floor coating is and how it can help both protect and enhance your home!